Arise Well Counseling Services, L.L.C. Arise Well Counseling Services, L.L.C. will be at the Barre Pointe studio conducting dance and movement classes geared toward children who may have difficulty communicating or expressing their feelings. 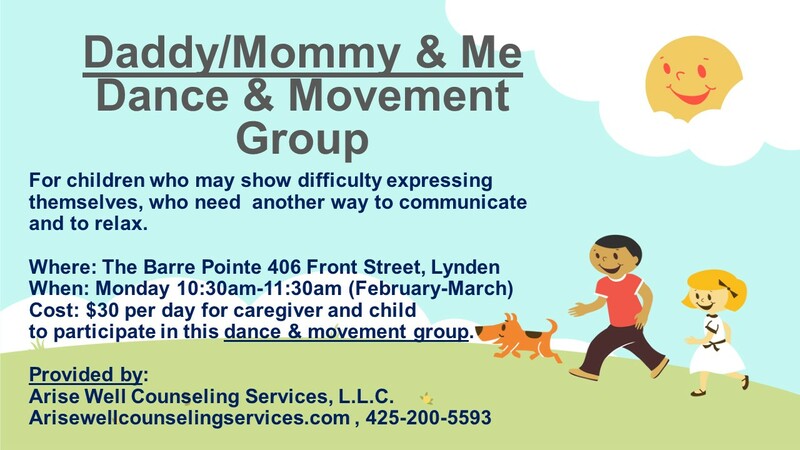 This is a therapeutic form of dance and movement for kids and their parent/caregiver. This is not put on by The Barre Pointe but will be held at their studio. If you have any questions please contact Lydia Peckover, MS, MA, LMHC at Arise Well Counseling Services, L.L.C.